The North Idaho College Cardinal Chorale and Chamber Singers will present a Winter Choral Concert at 7:30 p.m. Tuesday, March 14 in the Boswell Hall Schuler Performing Arts Center, on NIC’s Coeur d’Alene campus. The concert is free to the public. The concert will feature the well-known Requiem, Op. 48 by French composer, Gabriel Fauré. The Requiem Mass, or “Mass for the Dead,” is one of Fauré hallmark compositions and will feature the North Idaho College Choral Union as well as faculty members Marietta Hardy and Dwayne Huff. NIC student Kiera Conner and alumnus Jonathan Carney will serve as the featured soloists on this performance, conducted by NIC Director of Choirs Max Mendez. 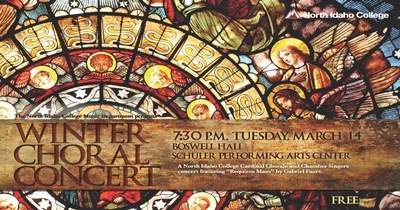 The NIC Choral Union consists of the Cardinal Chorale and Chamber Singers. The Choral Union has a long tradition of performing moving performances for audiences in the Inland Northwest and beyond. Both choirs have traveled throughout the United States and North America. Members of both ensembles have performed at Carnegie Hall in New York City. Choirs have also performed in Seattle, San Francisco, and Mexico. Members of the both choirs consist of NIC students, alumni, faculty and staff, as well as area community members. NIC Director of Choirs Max Mendez brings 36 years of experience to the Choral Union. Celebrating more than 11 years at the college, he strives to instill a sense of artistry, quality, beauty and community service in each performance. Mendez is active in area choral music and also serves as a clinician, performer, and guest conductor throughout the Northwest. The concert is free and open to everyone.